One of the most frustrating situations you can find yourself in when dealing with your livestock is discovering that one of your beloved fish has developed a parasitic or bacterial infection. Often you have very little time to asses the illness and determine a course of treatment before your fish has past the point of no return. To make matters worse, most of the useful medications on the market are not reef safe, so sick aquarium fish must be captured and placed into a quarantine tank for a minimum of 30-45 days before reintroducing them into the reef display. As you may know, catching fish and removing them from the habitat to which they are accustomed is not only disruptive to the overall aquarium, but also extremely stressful for the fish that you are trying to nurse back to health. So the question is, what do you do when you find yourself in this situation? The best solution we have found so far can be found in a little brown bottle from a small Canadian company called Poly Lab. Several years ago, Poly Lab developed a reef safe medication called Medic. 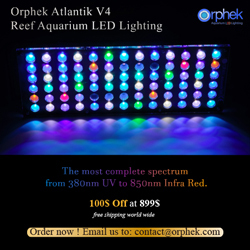 It is extremely effective, but for some reason, it has remained a well kept secret in the reef aquarium world. We have been using Medic for years and have found it to be extremely effective when treating external marine parasites and bacterial infections when caught in the early stages. In addition, it’s completely reef safe when used properly, so there is no need to remove your sick friend(s) from their home! As you often hear, early detection saves lives and when dealing with bacterial and parasitic infections, this adage holds true. We would recommend that you keep a good quality medication, such as Medic, on hand at all times. Don’t wait until your fish is sick before you go out and try to find a solution. Finding a reef safe product locally that actually has the potential to work is not as easy as you may think. More times than not, medications that are advertised to be reef safe are simply too mild to effectively treat the problem at hand. In addition, if your fish has become so sick that it is no longer eating, you may find that most medications on the market will not work at all. Save yourself the stress and frustration of dealing with a sick fish. 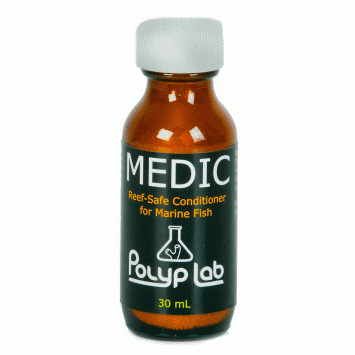 Keep a good medication such as Polyp Lab’s Medic in your arsenal of aquarium supplies at all times! You will find that when a situation arises, but you and your fish will be glad that you were prepared! Many external fish parasites have very similar life cycles. In particular, these parasites have an “attached” stage (trophonts), a “matured” stage (protomonts), a “reproductive” stage (tomonts), and a “free-swimming” stage (theronts/dinospores). Most available treatments do not target the free-swimming stage of the parasite which is one of the primary difficulties in dealing with these infections. Research with ciliated protozoans has shown that the “free-swimming” stage of these parasites have remarkably consistent hatching times. We have engineered our product to be most efficient during this stage. Our conditioner targets the trophont stage of the parasite but is also disrupting the life cycle during the “free-swimming” stage. Thus, when using Medic, hobbyists should try to maintain the highest concentration of the medication during this “free-swimming” time frame – when the oxidative component in the medication is particularly effective against theronts/dinospores. Note: Ozone and carbon must not be used during the treatment. Protein skimmers can be run as normal. UV filter can be used 1 hour after product has been add to the aquarium/sump. 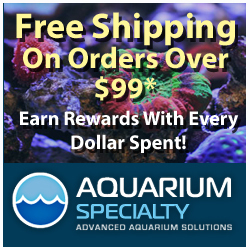 There’s no guarantee that Medic will restore your fish’s health back to normal but it will give your fish a fighting chance and you won’t have to pull you hair out trying to safely remove your fish out of the display aquarium. Medic sells for about $40.00 in the US.